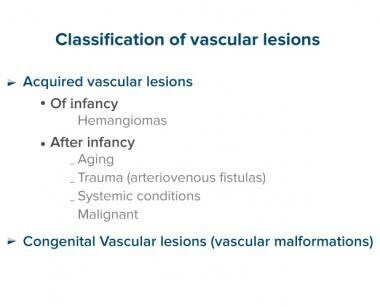 Vascular lesions of the skin can be divided into congenital and acquired lesions (see chart below). 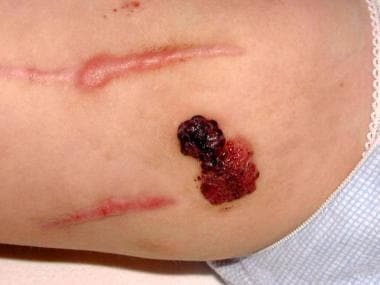 Congenital vascular lesions: The most common congenital vascular lesions are vascular malformations (VMs). Those lesions are the outcome of errors in vascular formation during embryonic life. VMs do not proliferate. Nevertheless, the dilated blood vessels that build up these lesions gradually enlarge. 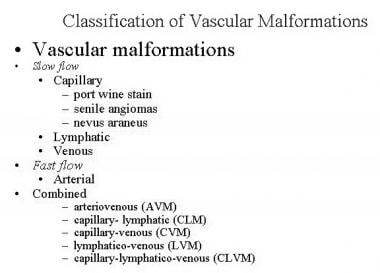 VMs can be classified based on the type of their blood flow into slow-flow (capillary, venous, lymphatic) lesions, high-flow (arterial) lesions, and combined slow/fast-flow lesions (see classification below). Based on the size of the lymph lumens, these lesions can be divided into microcystic lesions (previously termed lymphangiomas), macrocystic lesions (previously termed cystic hygromas), and a combined form. Acquired vascular lesions: The most significant acquired vascular lesions of infancy are hemangiomas. Hemangiomas are benign but potentially destructive tumors that are composed of proliferating blood vessels. These lesions undergo proliferative and involutional stages. 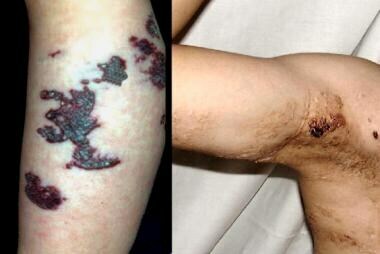 Pyogenic granuloma is another acquired vascular lesion that is frequently observed during childhood. It is of minor aesthetic significance compared with hemangiomas. After infancy, acquired vascular lesions are associated with aging (senile angiomas), trauma (arteriovenous fistulas), systemic conditions (spider angioma), and malignancy (Kaposi sarcoma). The classification of vascular lesions is confusing, and puzzling terms such as "capillary hemangiomas" are found in some textbooks. The classification presented here is based on the type of blood vessels, type of flow, and time of presentation. Exceptions exist to this division: some hemangiomas are congenital and some VMs are not present at birth. In general, the endothelial cell's fate is determined by the combined effects of a large number of positive and negative signals simultaneously transduced by numerous receptors. The candidate region contains a gene that encodes the VEGR R-3 gene. Cervicofacial lymphatic VM further occurs in trisomy 13, 18, and 21 and in Turner syndrome. Some have suggested that sporadic cases of lymphatic VM are caused by de novo dominant somatic mutations and that germline mutations are lethal. Mapping of the human genome will help clarify the exact regulators that are involved in the formation of lymphatic VMs. The diagnosis of a vascular lesion is based on medical history, physical examination, and imaging tests. The type of lesion usually can be determined easily based on the first 2 items. Imaging studies are mostly useful for confirming the clinical diagnosis, estimating the extent of the lesion, and determining the feasibility of surgical resection. Was the lesion present at birth? 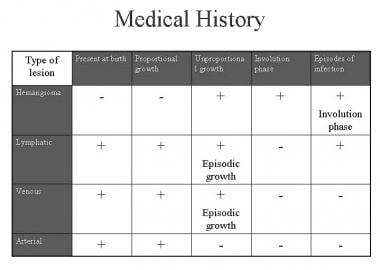 Did proportional or disproportional growth of the lesion occur after birth? Did an involution phase occur? Did an episodic enlargement occur? Clinical diagnosis of hemangiomas and venous, lymphatic, and arterial lesions can be made in a straightforward fashion based on the answers to the above questions (see chart below). A common feature of lymphatic VM is episodic enlargement associated with systemic or localized infection. The image below shows a 5-year-old child with a right leg lymphatic VM. The right lower picture shows acute infection of the lesion with typical redness, swelling, local warmth, and high systemic fever. Lower limb lymphatic vascular malformation. 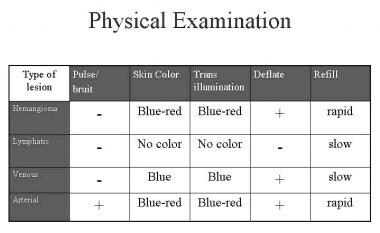 The physical examination of a patient with a vascular lesion includes inspection, palpation, and transillumination. The diagnosis of hemangiomas and venous, lymphatic, and arterial lesions can be made simply based on the above questions (see chart below). Lymphatic VM can have a small and localized or an extensive presentation. 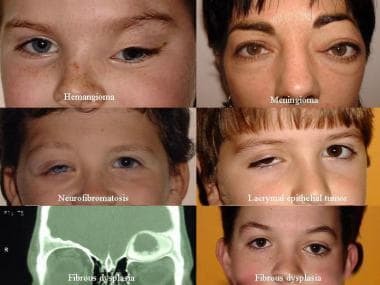 Lesions that are limited to the superficial layer of the skin are called lymphangioma circumscriptum (see images below). In the head and neck area, the lesions can involve the orbit and eyelids, cheek, tongue, and neck (see images below). 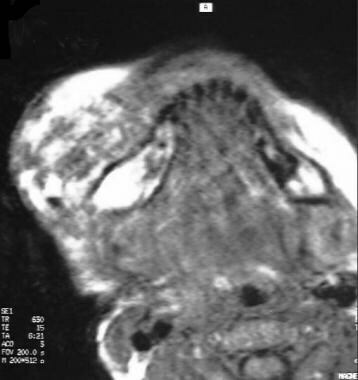 MRI of eyelid lymphatic vascular malformation. Right facial lymphatic vascular malformation with right open bite. Gradual enlargement of a facial vascular malformation. In the extremities, lymphatic VM can present as a localized or extensive extremity lesion associated with lymphedema and dysfunction (see images below). Contrast-enhanced T1-weighted spin-echo image of a venous-lymphatic vascular malformation. Large axillary venous-lymphatic vascular malformation. 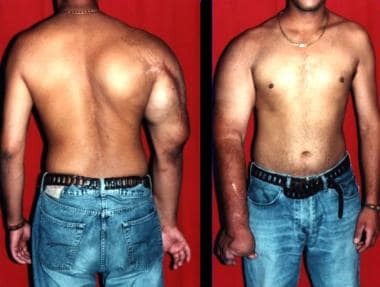 Huge upper limb lymphatic malformation. Skeletal distortion and hypertrophy are also common features of limb and facial lymphatic malformations. 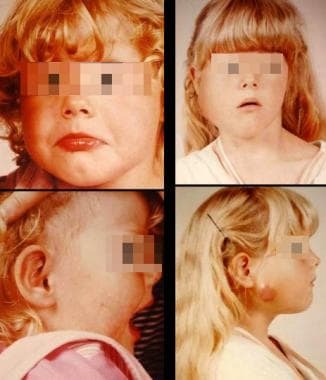 The image below shows the effect of a cheek lymphatic malformation on the mandible. Panorex showing mandibular hypertrophy due to a lymphatic vascular malformation. Assessment of asymmetry and deformity of the facial and limb skeleton should be part of the physical examination of patients with lymphatic VMs. Lymphatic VMs may be confused with deep hemangiomas or venous VMs. The presence of the lesion at birth supports the diagnosis of a VM, although congenital hemangiomas can be observed at birth. 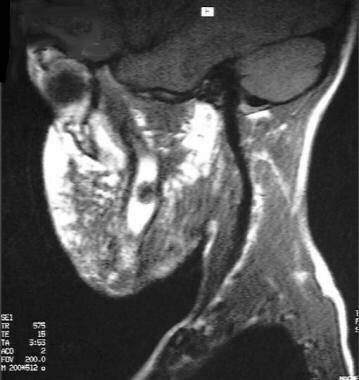 MRI can help distinguish between a VM and a hemangioma. The differential diagnosis also includes gliomas, benign tumors, and malignant tumors. The image below shows the differential diagnosis of orbital lymphatic VMs. Orbital hemangioma - Differential diagnosis. An intraorbital lesion usually presents as proptosis. It may expand rapidly and cause optic nerve compression, disk swelling, and decreased vision. 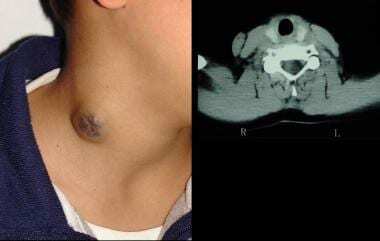 Cysts filled with blood ("chocolate" cysts) or lymph fluid may be aspirated under ultrasonographic guidance. Currently, no well-tested pharmacologic treatments for lymphatic VMs are available. Preliminary studies demonstrate that OK-432 may be useful for intralesional injection. Surgery may be indicated for superficial eyelid lesions and in selected patients with intraorbital lesions. Sufficient surgical excision of orbital tumors without injury to intervening structures is difficult. 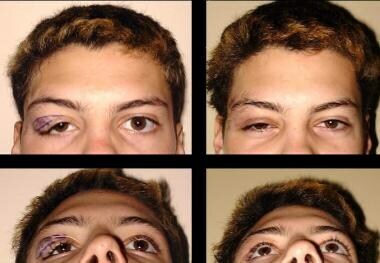 The first image below shows a 14-year-old boy with a right upper eyelid lymphatic lesion that had caused ptosis of the right upper eyelid (images on left). 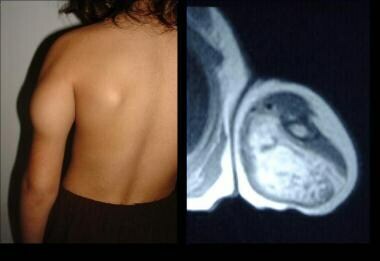 The second image shows an MRI of the lesion. Improvement in his visual field was achieved after excision of the lesion. Sublaryngeal lesions may compress the soft tracheal rings of infants. Intralesional injection with alcohol may be successful in macrocystic lesions but also may be followed by acute swelling and airway obstruction. Tracheostomy may be required in selected patients. Localized limb lesions (see images below) are mostly of aesthetic concern. 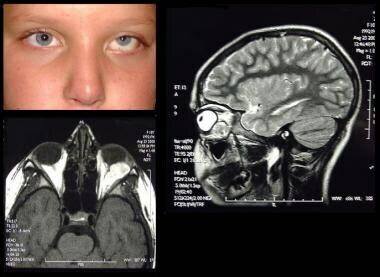 Large lesions (see images below) may be associated with functional handicap. Treatment may be indicated in such individuals. Infections as part of a systemic disease or as a localized problem are frequently observed in patients with lymphatic VMs. The image below (lower right) shows acute infection of a lower limb lesion. Long-term antibiotic treatment and compression stockings may decrease the incidence of infections. Lymphatic lesions with a superficial component are associated with chronic shedding of small cysts, lymph leak, staining, and an unpleasant odor. The image below shows a 12-year-old boy with a lymphatic lesion involving the entire right leg. Good hygiene was very difficult to maintain at the toe area. Lymphatic VMs are composed of dilated lymphatic channels. They are filled with a proteinaceous fluid and do not have connections to the normal lymphatic system. Lesions can be primarily macrocystic or microcystic. Thoracic lesions are usually macrocystic and cervicofacial lesions are usually microcystic. 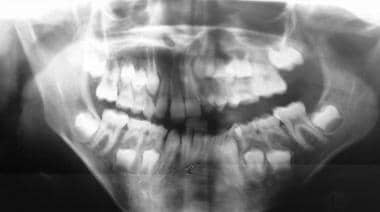 Lesions are located at the skin and subcutaneous tissue but may invade the floor of the mouth, cheek muscles, and other anatomic structures. 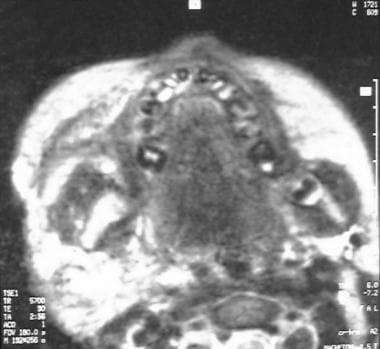 The images below show an MRI of a 9-year-old child with a right facial lesion that extended into the floor of the mouth and cheek. Venous or lymphatic lesion on T2-weighted spin-echo image. Contrast-enhanced T1-weighted spin-echo image showing rim enhancement, which is typical of lymphatic vascular malformations. Contrast-enhanced (gadolinium) T1-weighted spin-echo image showing areas with rim enhancement, which are typical of lymphatic vascular malformations. Patient is allergic to the sclerosant or contrast media. Patient has a cardiac condition. Systemic leak of the sclerosant cannot be avoided. Significant skin or mucosal injury is expected. Postinjection swelling puts another organ at risk (eg, injury to the optic nerve). Postinjection airway swelling cannot be managed by a tracheal tube or tracheostomy. Intraoperative and postoperative bleeding cannot be controlled. Surgery puts another organ at risk (eg, injury to the eye or facial nerve). Mulliken JB, Glowacki J. Hemangiomas and vascular malformations in infants and children: a classification based on endothelial characteristics. Plast Reconstr Surg. 1982 Mar. 69(3):412-22. [Medline]. Mulliken JB. Vascular anomalies. Aston SJ, Beasley RW, Thorne CHM, eds. Grabb and Smith Plastic Surgery. 5th ed. NY: Lippincott Raven Publishers; 1997. Jackson IT, Carreño R, Potparic Z, Hussain K. Hemangiomas, vascular malformations, and lymphovenous malformations: classification and methods of treatment. Plast Reconstr Surg. 1993 Jun. 91(7):1216-30. [Medline]. Breugem CC, van Der Horst CM, Hennekam RC. Progress toward understanding vascular malformations. Plast Reconstr Surg. 2001 May. 107(6):1509-23. [Medline]. Cha B, Srinivasan RS. Mechanosensitive β-catenin signaling regulates lymphatic vascular development. BMB Rep. 2016 Aug. 49 (8):403-4. [Medline]. [Full Text]. Carmeliet P, Collen D. Vascular development and disorders: molecular analysis and pathogenic insights. Kidney Int. 1998 Jun. 53(6):1519-49. [Medline]. Alomari AI, Karian VE, Lord DJ, Padua HM, Burrows PE. Percutaneous sclerotherapy for lymphatic malformations: a retrospective analysis of patient-evaluated improvement. J Vasc Interv Radiol. 2006 Oct. 17(10):1639-48. [Medline]. Suzuki Y, Obana A, Gohto Y, Miki T, Otuka H, Inoue Y. Management of orbital lymphangioma using intralesional injection of OK-432. Br J Ophthalmol. 2000 Jun. 84(6):614-7. [Medline]. Padwa BL, Hayward PG, Ferraro NF, Mulliken JB. 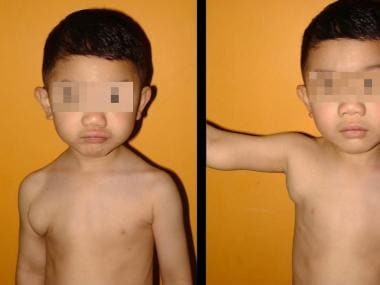 Cervicofacial lymphatic malformation: clinical course, surgical intervention, and pathogenesis of skeletal hypertrophy. Plast Reconstr Surg. 1995 May. 95(6):951-60. [Medline]. Armstrong DC, ter Brugge K. Selected interventional procedures for pediatric head and neck vascular lesions. Neuroimaging Clin N Am. 2000 Feb. 10(1):271-92, x. [Medline]. Marler JJ, Mulliken JB. Current management of hemangiomas and vascular malformations. Clin Plast Surg. 2005 Jan. 32(1):99-116, ix. [Medline]. Chaudry G, Burrows PE, Padua HM, Dillon BJ, Fishman SJ, Alomari AI. Sclerotherapy of Abdominal Lymphatic Malformations with Doxycycline. J Vasc Interv Radiol. 2011 Aug 6. [Medline]. Odeyinde SO, Kangesu L, Badran M. Sclerotherapy for vascular malformations: complications and a review of techniques to avoid them. J Plast Reconstr Aesthet Surg. 2013 Feb. 66(2):215-23. [Medline]. Ernemann U, Kramer U, Miller S, Bisdas S, Rebmann H, Breuninger H, et al. Current concepts in the classification, diagnosis and treatment of vascular anomalies. Eur J Radiol. 2010 May 11. [Medline]. Mohan AT, Adams S, Adams K, et al. Intralesional bleomycin injection in management of low flow vascular malformations in children. J Plast Surg Hand Surg. 2015 Apr. 49(2):116-20. [Medline]. Paramasivam S, Fay A, Fifi J, et al. O-015 image guided bleomycin sclerotherapy for orbital lymphatic malformation. J Neurointerv Surg. 2014 Jul. 6 Suppl 1:A8-9. [Medline]. Buckmiller LM, Richter GT, Waner M, Suen JY. Use of recombinant factor VIIa during excision of vascular anomalies. Laryngoscope. 2007 Apr. 117(4):604-9. [Medline]. Sandler G, Adams S, Taylor C. Paediatric vascular birthmarks--the psychological impact and the role of the GP. Aust Fam Physician. 2009 Mar. 38(3):169-71. [Medline]. [Full Text]. Zuker MR, Cohen M. Congenital hand anomalies (discussion). Goldwyn RM, Cohen MN, eds. The Unfavorable Result in Plastic Surgery Avoidance and Treatment. 3rd ed. Philadelphia: Lippincott Williams and Wilkins; 2000. 710-713. MRI - MRI T1, T2.